I love this track pulse poundingly good full on celtic boogie with hints of Peatbog Faerie like fiddling from Mary Custy. As I said when I first put this up Bushplant have made this available as free download on the understanding that if you get it you will donate something to a children s charity. Not a bad deal in my book and they will be appearing on the Drystone stage this year. Back from podcast number 1 here’s my good friend Banjo Bill Lloyd with his wonderful version of Joni Mitchells “Carey” there is something about Bills singing here that just makes me feel so good every time I hear it. Bill who runs the session yurt at Solfest (and about a million other festivals too) is one of those people that seems to bring out the best in others. No one who wishes to play is ever turned away and are encouraged to join in and not hold back. Top man. Since I first met Ric and Chez on Preston platform (doing a soft shoe shuffle dance, thanks Jethro) the have performed a cracking set on The Drystone and I’m still in admiration for the sheer quality of songwriting. So much so I emailed Steve Lamacq and said he should check them out. He did and has subsequently played them on two of his shows. Remember you heard them first here. Pure good trippy music thats beyond definition, is it folk, is it psychedelic, is it neo classical or something else altogether. Whatever, it’s very good. Just let it wash over you and enjoy. There’s a strangely haunting quality to MMM’s music, and another band the the aforementioned Mr Lamacq likes too. Though he got wind of them before I did. Complication on the journey up to Cumbria meant they arrived late and had to play a truncated set at Solfest but that being said if you flip to the previous blog to this you can see them performing unplugged in the bus that was behind the stage. If this track from Scotlands Dumb Instrument doesn’t make you feel a bit spooked, you have something wrong with you. It’s an unsettling comment on the time we live in but exceptionally well done. Another studio recording from Ted Chapman aka “The Cactus Room” He has created a rhythm which he calls “Diddley Reggae” Diddly reggae was born when Ted fastened a bit of a Bo Diddley riff onto half a bar of a reggae ‘Skank’ – The groove felt good but it had a chopped half a beat off the bar, making it 7/8 time. So when thinking about it, the only other popular tune in sevens is Pink Floyd’s ‘Money‘ and you cant dance to that. Invent your own footwork that fits and you can name that dance. Can you do the Diddly reggae? Its 1-2-3-4- – 1-2-3- – 1-2-3-4 – -1-2 ….. Go on have a go. A great favourite of me, The Drystone Stage and my open mics at the Spinners Arms. Rob is now studying music over in Newcastle so we don’t see him quite as much but I’ll take any opportunity I can to play his stuff, so here’s a new one from his album “Korsa Floden” which is I believe a river in Norway. It’s just damn good music. Ten Bears current single is the theme tune for Channel Fours T4 Orange Unsigned band show. They’ve not been on the podcast before, nor have they been on the Drystone. But when this track arrived via email I simply had to put it up on the podcast. I passed it on to Gerard who runs our mainstage saying that I thought they were worth a slot. So you never know. Being the first part of a larger work that may end up as a print piece rather than a full recording. And that’s it for 2008. Next cast up will feature some of the acts lined up for appearing on the Drystone Stage this this year and believe me I have some TRULY FANTASTIC musicians already booked and more to come. A word to the wise also, tickets for Solfest 2009 go on sale next Monday, February 9th full details will be on the Solfest website tomorrow Feb 4th . 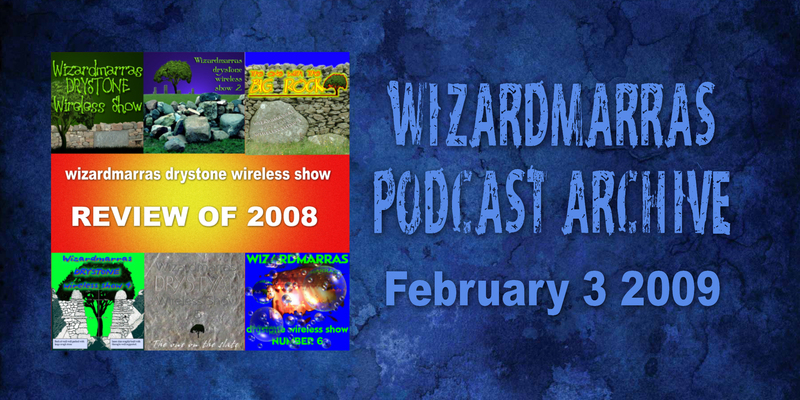 This entry was posted in The Wizardmarra's Wireless Show Podcasts and tagged Bands, Best New Musicians, Great Music, Music Videos, Musicians & Artists, Podcasts, Unsigned Artists, YouTube Clips & Uploads by Alan Whittaker. Bookmark the permalink.